Help us prevent spam. Enter the code before sending the message, thank you! 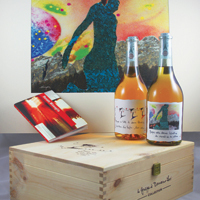 999 labels (unique pieces) and original painting by Renato Missaglia inspired by the theme of the “Donna Selvatica che scavalca le colline” (Wild Woman who climbs over the hills). Works of art 40 x 30 cm (approx) made by the artist (www.renatomissaglia.it) and unique labels for an exclusive collection of “Grappe Ambrate Gran Riserva” (Grand Reserve Amber Grappa) from the Romano Levi Distillery in Neive.